We want you to be satisfied. Please contact us by email if you can’t find your answers here. Your account with us will act as a transcript for a full 7 years. Our courses are designed with the professional in mind. Available in a convenient PDF format, the engaging content and questions will meet all your professional requirements. + What are the courses like? Each course is a PDF with page counts from 10-75. Each course averages around 10 pages per contact hour. The questions are spread throughout the material in sections of 2-3 pages enabling you to read and answer at your pace. The test is completed by entering the answers on the website and your answers will not be scored until submitted for grading. A certificate, also in PDF format, is generated upon passing. You can download this certificate for your files but a copy is always available in our account with us. + What is the passing score, and what happens if I don’t pass? A passing score of 75% is required. Two attempts at scoring 75% are given, with the questions remaining the same. If you fail after the second attempt the course must be purchased again. The questions are the same. + Are your courses ASHA approved? No, however, ASHA accepts our hours towards your ASHA renewal. They require you submit your certificate of completion along with your ASHA member number and request the hours be added to your transcript. + Are your courses approved by any national professional boards? No, we strive the keep the prices of our courses as low as possible. Most professional boards will accept our hours if you send them the certificate of completion. + How long is my course good for? We give you two years to complete a course from it’s purchase date. Find the complete list of courses available to your profession by clicking on your profession on the ‘Courses’ page. Some courses satisfy multiple professional licenses. + I don’t like shopping online, do you offer mail order? Yes. You will see the option to enter your mailing address on the checkout page when you are purchasing a course. + I'm not sure I want to use my credit card on your site. How do you process and store credit card information? We do not have access to your credit card information. We use a third party merchant service with a comprehensive security policy (read here). We think you will be satisfied with your purchase, however, if you need a refund we are happy to accept returns of unused (meaning you have not attempted the exam) hours. Once a test has been attempted there are absolutely no refunds. 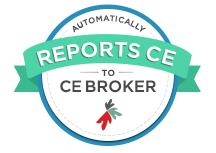 CE Broker is a mediating service between state professional boards and professionals in some states. If your state doesn’t use CE Broker you will not be affected. + When do you report? Completed course hours are submitted to CE Broker (if applicable) every morning. + What do I need to do to make sure my hours are reported? To be submitted, your license number must be complete, with any beginning letters, followed by the numbers. There usually are no spaces, zeros, or dashes in the number. 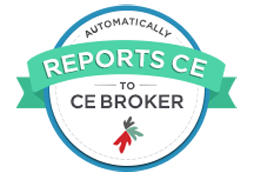 If you do not see the course completions on your CE Broker record within 48 hours, then there might be a problem with your record. Please email us at email@consultantsforthefuture.com and we will look into this for you. + Can I Self-Report right away? Hours to CE Broker can be self-submitted using the course tracking number. This can be found at the bottom of the answer sheet (last page) in the course pdf, or it can be searched by title on the CE Broker website. Your account with us will act as a transcript. We provide you access to all your certificates for 7 years. + How do I access the "My Account" page? You can click on your name in the top menu bar, or on the “My Account” link in the footer, or you can click right here! + I don’t have a license number, can I still register? Absolutely, many professionals use our services to obtain a professional license or fulfill an employer requirement. Simply leave the license number section of your account blank. + What do you do with my personal information and why do you require my physical address? We promise never to mail you anything. It is a legal requirement that we have a licensee’s full name and address on file for state verification during a professional’s audit. For this reason, we suggest using the address on your state license, if applicable. + I can’t find a certificate but all my other certificates are in my account. This happens when you have multiple accounts. Send us an email with your full name and license number and we will try to merge any outstanding records into your account. + My name has changed but I can’t change it in my account. Please email us a request for a name change. We legally keep a record of names used for certificates. + I completed my courses with my old name, what do I do? The board does not track it’s professionals by name, only by license number. We want to help you with any difficulties you may encounter. We are a small business and ask for your patience. Contact us by email or fill out the form below to send us a message. We will answer you as soon as possible.